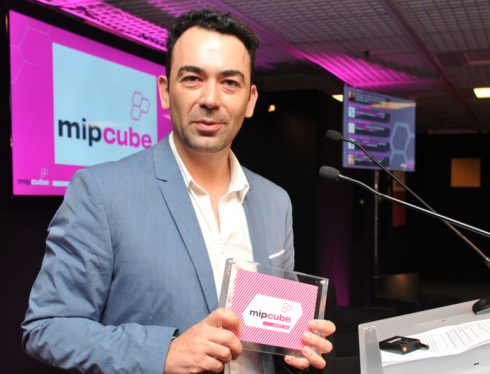 There have been numerous contests running at MIPCube this year, from hot startups and creative hackers to branded entertainment and transmedia innovation. It’s about the taking part as much of the winning, of course. But the winners in four categories were announced this afternoon at the MIPCube Innovation Snack & Screen session. The presenter was Louisa Heinrich, founder of Superhuman Limited. First up, startup contest MIPCube Lab, which is in its third year. 60 startups entered, and were narrowed down to 10 startups who pitched to a panel of judges this week. After a spot of advice – startups should always kick off their pitch with a “one-sentence description of what your business is” – the winner was named. And it was… Israeli company Stevie (whose Gil Rimon is pictured above), whose technology turns online video and social graphs into a “beautiful broadcast TV experience” through apps on various platforms. Or, as Rimon put it, “Stevie takes everything off your feed and makes a background ‘lean-back’ experience.” There was a special mention for real-time analytics service Streamhub too. Next up, the TV Hack winner was announced, after 48 hours of hackers trying to “rethink the way we are consuming videos”. The winner was Reactive Video Player from Andrei Gheorghe and Audrey Martel (pictured with event partner Bemyapp’s Cyril Attia, left) – hackers from Romania and France respectively, who hadn’t met before this conference. Their hack is a way to control multi-angle video footage with gestures and the position of your face according to a webcam: look to the left or right, or move backwards or forwards to switch between different angles. “This could be useful for talk shows, or sports, or something that can be shot with multiple cameras in parallel,” said Andrei. The next award was for the Content 360 competition, which aims to find “the most innovative new ways of telling stories”, with five finalists competing for a €5000 prize. The winner was Alex Alexander from Four Twelve in Australia, with the project Step 1. It’s a transmedia drama that plays out in real-time, with the aim of persuading people to use the internet more on their smartphones. “Imagine that there was a real threat that cable internet could be taken away,” he said, outlining the plotline, which focuses on a nationwide cyber-attack in Russia. Its premise: the only form of safe internet use is mobile data. The project includes a gaming element, with the smartphone at the centre of the action. The story starts on TV, moves to mobile and a web community, with social networks all playing a role too. 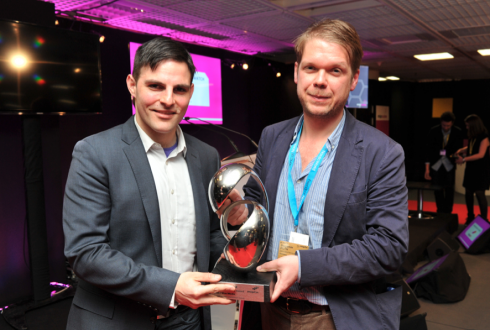 The last award was for Brand of the Year: The Creators Project, a global arts partnership between Intel and Vice. Vice Media’s Benjamin Ruth sat down for a Q&A during the session. He cited an upcoming project with Daft Punk as a prime example, before talking about how Vice measures success. The bottom line: “We created relevancy among an audience that is crucial to Intel. Loyalty, engagement rates, all these kind of things,” he said, before giving some advice to other marketers. 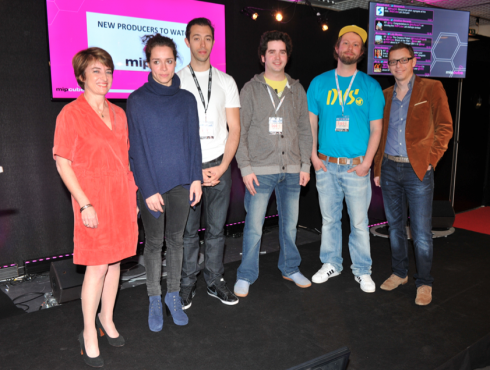 The session ended with a segment on MIPTV’s five “New Producers to Watch” for 2013. From Germany: Arabella Bartsch; from Canada, Ryan Nadel; from Ireland, Richard Boland; from Finland, Hannu Outila; and from Belgium, Jimmy Blibaum. The five were nominated by broadcasters in their home countries as talents worth watching in the year ahead. For more innovation in the coming months, don’t miss LeWeb London, June 5-6!